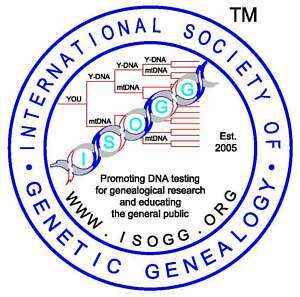 ISOGG (International Society of Genetic Genealogy) is not affiliated with any registered, trademarked, and/or copyrighted names of companies, websites and organizations. This Y-DNA Haplogroup Tree is for informational purposes only and does not represent an endorsement by ISOGG. The first phylogenetic chart to unify nomenclature was published in 2002 by the Y Chromosome Consortium (YCC). The 2003 Y-DNA phylogenetic chart appeared in Mark A. Jobling and Chris Tyler-Smith, The Human Y Chromosome: An Evolutionary Marker Comes of Age Nature Reviews|Genetics, Figure 5. In 2005 Family Tree DNA created the 2005 Y-Chromosome Phylogenetic Tree. An ISOGG group was formed in November 2005 to create a web-based document using Richard Kenyon's style of an indented list which could be updated to keep pace with the rapid developments in the field. Current ISOGG members who work with the tree are: Coordinator: Katherine Borges. Content editors: Ray Banks, Owen Lu. Content persons liaison with experts from various reliable sources to determine what information is needed to amend the tree. The Y Haplogroup classification of the male Y-chromosome is currently used to estimate the population group of the paternal line. The haplogroups are identified by the letters, A through T. Haplogroups are subdivided into one or more levels, called subclades, and thus forming a tree. The Y-chromosome haplogroup is determined by performing a sequence of SNP tests. Each line lists a haplogroup or subclade in boldface, then one or more SNPs follow on the same line. For a sample to belong to a particular subclade, it must test positive for any one of the SNPs appearing on the line, providing positive results were obtained for its haplogroup and any intervening subclades. BZ = Q-M242 Project, Family Tree DNA, Houston, TX. SNPs named in honor of Barry Zwick. JD = David Stedman using Big Y and other NGS sources. PLE = Stanislaw Plewako, M. Sci, Baltic Sea DNA Project. PR = Primate (gorilla and chimpanzee), Thomas Krahn's WTTY. Some sources have not provided new names when same mutation found independently in humans. RC = Major Rory Cain, BA(hons), BEd, BSc. V = Rosaria Scozzari and Fulvio Cruciani, Dipartimento di Biologia e Biotecnologie “Charles Darwin” , Sapienza Università di Roma, Rome, Italy. YP = SNPs identified by citizen scientists from genetic tests, then submitted to the Y Full team for verification. Z = Gregory Magoon, Ph.D., Richard Rocca, Vince Tilroe, David F. Reynolds, Bonnie Schrack, Peter M. Op den Velde Boots, Ray H. Banks, Roman Sychev, Victar Mas, Steve Fix, Christian Rottensteiner, Alexander R. Williamson, Ph.D., John Sloan and an anonymous individual, independent researchers of publicly available whole genome sequence datasets, and Thomas Krahn, MSc (Dipl.-Ing. ), with support from the genetic genealogy community. ZP = Peter M. Op den Velde Boots, David Stedman using Big Y and other NGS sources. ZQ = Gabit Baimbetov, Nurbol Baimukhanov "ShejireDNA project" and other members of the project. ZS = Gregory Magoon, Ph.D., Aaron Salles Torres from samples from Full Genomes and the Big Y.
ZW = Michael W. Walsh using Big Y.
ZZ = Alex Williamson. Mutations in palindromic regions. Each ZZ prefix represents two possible SNP locations. Please cite this document as follows: International Society of Genetic Genealogy. Y-DNA Haplogroup Tree 2019, Version: [Number given at top of Main Page], Date: [Date given at top of Main Page], http://www.isogg.org/tree/ [Date of access: Day, Month, Year]. ISOGG Y-DNA Haplogroup Tree Coordinator: Katherine Hope Borges.